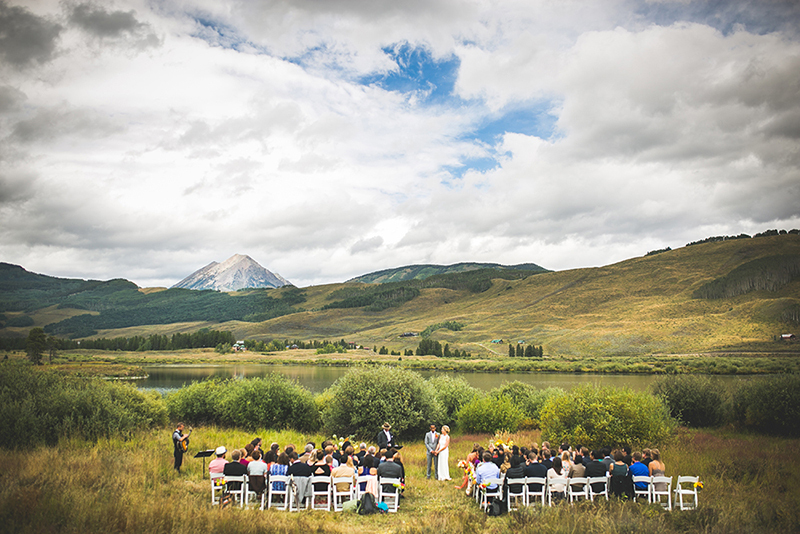 Experience your special day in a unique setting, surrounded by aspens and fir trees, abundant wildflowers, magnificent peaks, winding rivers, and tranquil lakes. 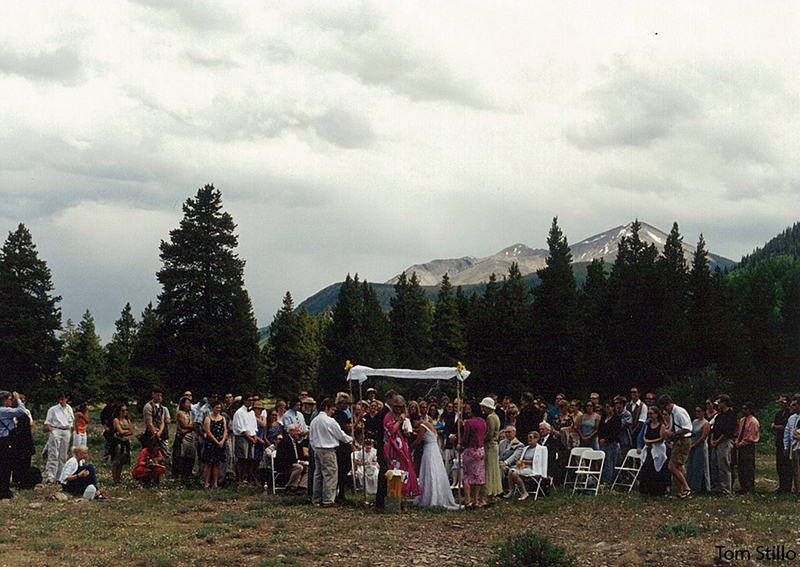 The Crested Butte Land Trust offers a special opportunity to conduct weddings on four of its stunning properties. Reservations are on a first come, first served basis. The Land Trust requests a minimum, tax-deductible donation of $750 for the use of the property. In addition, a refundable deposit of $250 is required to ensure the property is left clean and undamaged. Please review the contract for your site, which contains guidelines to protect the wildlife and vegetation. 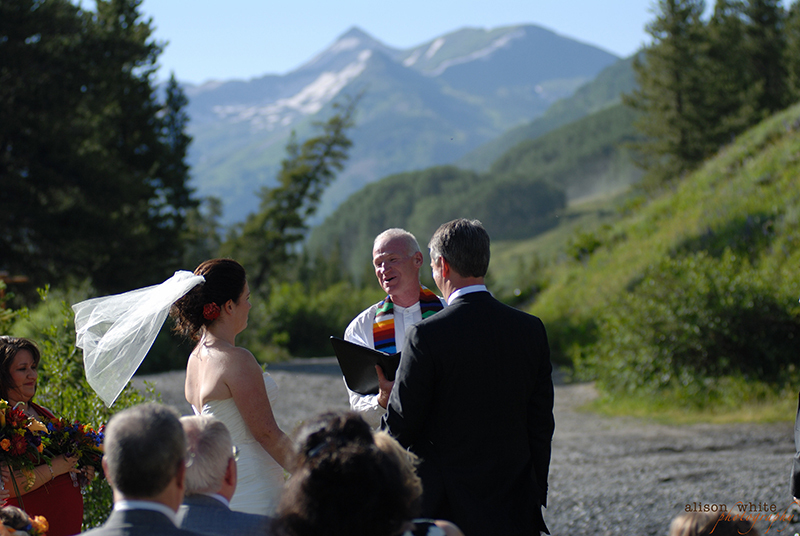 Nestled in the aspens, just steps above the Town of Crested Butte, the Woods Walk is our most popular wedding site. 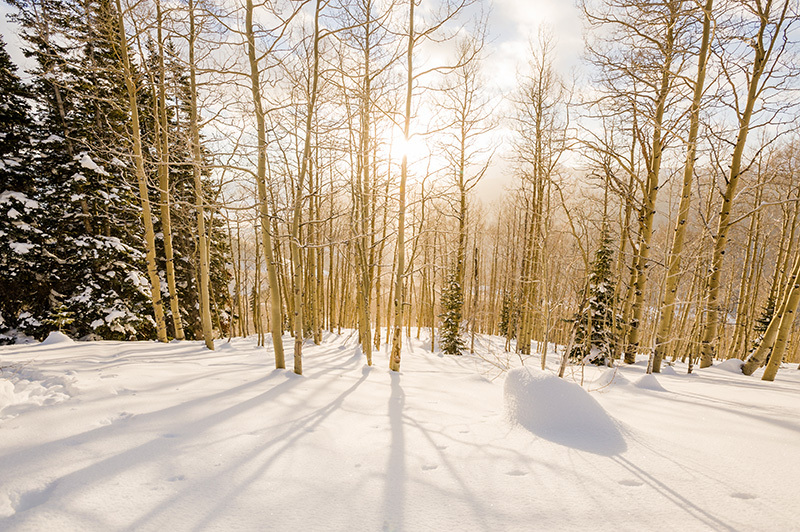 A groomed trail leads you on a short walk through the woods from the road on Kebler Pass. Crested Butte Mountain sets the backdrop to this site, where summer’s wildflowers grow tall and fall’s golden aspens dance around you. Resting on the shores of the lake, the Peanut Lake wedding site is open, with grasses, willows. Located just off of Peanut Lake Road, this wedding site is convenient to access, and great for larger wedding parties (up to 100). Stunning, 360-degree views await, with a serene lake in the foreground. Resting on the banks of the Slate River, the Gunsight Bridge wedding site is tucked in the forest, with incredible view of Paradise divide on one side and Mt. Crested Butte on the other. Accessible by Slate River Road, this wedding site is convenient to access, and great for small wedding parties. It is great combination of stunning views and a beautiful river setting. This site is located about 1 mile from the Lower Loop Trailhead. It is accessible along a flat, easy walk, however, this site may be difficult for older or less capable friends and family. There are benefits to being a little farther from the parking lot, though. If a wedding site appears on the calendar, it is already booked for that date. If your date and wedding site are available, please fill out the appropriate wedding contract (Step 3) to reserve! Calendar is updated as soon as reservations are confirmed. 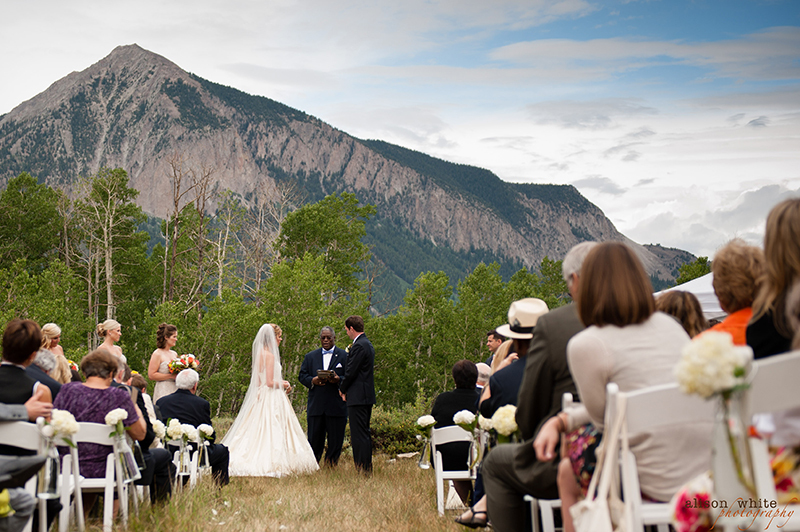 Nestled in the aspens, just steps above the Town of Crested Butte, the Woods Walk is our most popular wedding site. To reach the Woods Walk in the winter, you have to cross a groomed ski trail that is maintained by Crested Butte Nordic. In order to respect their operations, we require that all guests either use snowshoes or cross-country skis to get to and from the site. It’s a short distance (less than 1/2 a mile), but walking on the groomed trails negatively impacts the experience for other users. We also suggest that you contact CB Nordic with the date of your wedding and a donation. In order to reach the site, you have to cross a ski trail that is groomed and maintained by Crested Butte Nordic. In order to respect their operations, we require that all guests either use snowshoes or cross-country skis to get to and from the site. It’s a short distance (less than 1/2 a mile), but walking on the groomed trails negatively impacts the experience for other users. We also suggest that you contact CB Nordic with the date of your wedding and a donation. The Land Trust schedules ceremonies on a first-come-first-serve basis. All gatherings must be pre-scheduled and approved by the Crested Butte Land Trust Outreach Coordinator. The donation necessary for scheduling a gathering at the Woods Walk is $800 and is required at the time of booking. Please make checks payable to Crested Butte Land Trust. In addition, a refundable deposit of $250 is also required to ensure the property is left in a clean and natural condition. The property will be inspected by the Land Trust after the gathering to determine, at its sole discretion, whether the deposit shall be refunded. If for any reason the ceremony is canceled, there will be a $150 non-refundable administration fee. If the cancellation is within 24-hours of the ceremony, we are unable to offer any refund. To reserve the site, please fill out the form below. Please feel free to contact us to discuss the location, timing, and other details of your special day.